What says spring more than baby rabbits popping up here, there, and everywhere? I can't think of too much really! 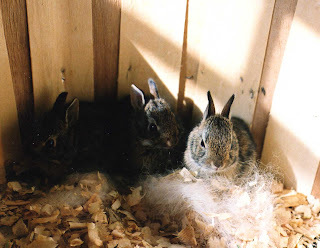 This photo is of three little ones that Annika (last season's very helpful Waldorf student from Germany) and I looked after for awhile last May...they were very cute, especially when they figured out how to jump out of the bushel basket they were living in! It seems that rain is also very "in" this spring - which is fine by me, although it has made it a little tricky to fit in all of the garden work between showers recently. 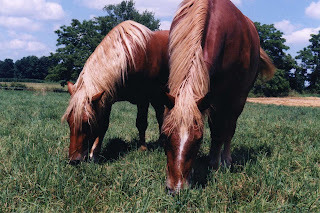 On this week's agenda, rain or shine though, is to plant the leeks and onions, mulch the garlic, and finish the plowing (amongst many, many other things!). The onions had all been sitting outside in their trays for the last week, happily awaiting transplanting, however, given tonight's FROST WARNING, I dutifully schlepped them all back inside the hobbit house, lest they get nipped on the lawn. 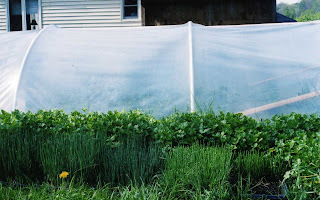 The strawberries, which are now blooming rather earnestly in the garden, also got tucked in under two layers of row cover this afternoon - as I'm not sure whether my sister Kelly could ever forgive a crop failure when it comes to her beloved "strawbeezlies". Be sure to start checking the blog more regularly, as I hope before too long to post information about this year's CSA, ordering strawberries (yes, that's right, strawberries in June! ), and some work bees to be scheduled throughout the summer. Happy spring everyone! Although risotto is a bit of a labour of love, it is SO delicious and well worth the effort! Think about tossing in some fresh peas once they’re in season! Put the stock in a saucepan. Heat until almost boiling, then reduce the heat until barely simmering to keep it hot. Heat the butter and oil in a deep skillet or heavy-bottomed saucepan over medium heat. Add the shallots and cook for 1-2 minutes, until softened but not browned. Add the garlic. Add the rice and stir with a wooden spoon until the grains are well coated and glistening, about 1 minute. Pour in the wine and stir until it has been completely absorbed. Add 1 ladle of hot stock and simmer, stirring until it has been absorbed. Continue to add the stock at intervals and cook as before, until the liquid has been absorbed and the rice is tender but firm (al dente), about 18-20 minutes. Add the Parmesan, lemon zest, cream, mint, salt and pepper. Mix well. Remove from the heat, cover, and let rest for 2 minutes. Spoon into warmed bowls, top with chopped mint, and drizzle with extra virgin olive oil. Serve immediately.